Absolute Pressure — Pressure measured relative to full vacuum. Referred to as pounds per square inch absolute (PSIA). Atmospheric Pressure — Pressure of the atmosphere at the earth’s surface NIST standard atmospheric pressure = 1.01325 bar. BAR — Unit of pressure (or stress). 1 bar = 750.07 mm of mercury at 0°C, at 45°. Barometric Pressure — Atmospheric pressure, often measured in millibars, in Hg (inches of mercury), or hectopascals. Burst Pressure — The maximum pressure that may be applied to the positive pressure port without rupturing the sensing element. Capacitive Sensing — Detection and measurement of pressure through the change in voltage across a capacitor, one plate of which is a diaphragm which deflects slightly with changes in applied pressure. Compound Pressure — Pressure measured from full vacuum (-14.7 PSIV) to gauge pressure, referencing atmosphere. Differential Pressure — Pressure measured relative to a reference pressure. 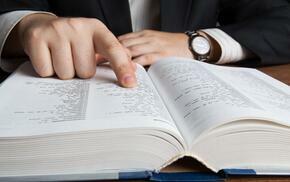 Referred to as pounds per square inch differential (PSID). FS (Full Span or Full Scale) — The range of measured values over which a transducer is intended to measure, specified by the upper and lower limits.EX: 0 to 100 PSIG, FS is 100 PSIG/0 to 5 VDC, FS is 5 VDC, 800-100 MB FS is 300 MB. Gauge Pressure — Pressure measured relative to ambient atmospheric pressure. Quantified in pounds per square inch gauge (PSIG). Manometer — An early instrument for measuring pressure; originally, a U-shaped tube containing liquid (water, oil, or mercury), one limb opening to the gas volume to be measured, the other closed or connected to a registering or recording instrument. Modern versions utilize diaphragms, bellows or other devices for sensing relative pressures. Millibar (mbar) — Unit of pressure generally used in barometric measurements: 1 mbar ± 100 N/m2, or 10 = dyn/cm2. Newton (N) — The unit of force in the International System of Units (SI); the force required to impart an acceleration of 1m/sec2 to a mass of 1 kg. P/I — Term common to process industries meaning pressure-in/current-out. (3-15 PSIG Input to 4 to 20 mA DC Output). Pressure Transducer — An electromechanical device for translating fluid pressure values into voltages across a high-impedance (5k ohms or greater) load. Pressure Transmitter — An electromechanical device for translating fluid pressure values into currents (generally 4 to 20 mA) into a low-impedance load. Proof Pressure — The maximum pressure that may be applied without changing performance beyond specifications (typically, 0.5% FS zero shift). PSIA — Pounds per square inch absolute. PSIV — Pounds per square inch vacuum. Span — The algebraic difference between the limits of the range. Ex: 0.1 to 5.1 Volts DC; span is 5 VDC. Sometimes used to designate full scale output; i.e. 5 VDC. Vacuum — Generally refers to pressures between 0 and atmospheric; often measured in 0-30 in Hg Vacuum. Referred to as pounds per square inch vacuum (PSIV). Relative Humidity — Relative humidity is a measurement of water in the air at a given temperature. Relative Humidity Accuracy — RH accuracy is the error between the actual RH and the RH indicated by the humidity sensor. Relative Humidity Repeatability — Repeatability is the ability of the sensor to reproduce the output when moving in one direction, either from low to high RH or high to low. RH Sensor Interchangeability — Interchangeability is the %RH error introduced when replacing a sensor tip with a new sensor tip. RH Long Term Stability — Long term stability is the %RH error of the sensor over time. RH Sensor Recovery from Condensation — Recovery after exposure to condensing conditions. Sensor should self-recover after the moisture on the surface evaporates. RH Sensor Recovery from Chemical and Physical Contaminants — Sensing surface coated with a micro-pourous metal electrode, allowing the polymer to absorb moisture while protecting it from contamination and exposure to condensation. Current Sensor — A Current Sensor is a device that detects electrical current (ACor DC) in a wire, and generates a signal proportional to it. 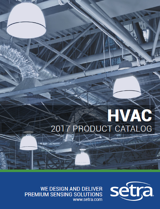 CLICK HERE to view Setra's HVAC Product Catalog.